2013 Acura TL reviews from Acura of Peoria can be found underneath the video below. Don't stress out over your next purchase; look to the premier Acura dealership in Phoenix for thoroughly researched reviews written by industry specialists. Acura TL information you can rely on to make educated decisions is right here - each article is bundled with [helpful facts and specs - all at your fingertips. 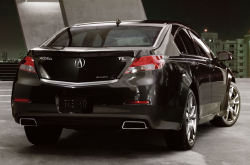 Is the Acura TL right for you? Read on and find out! By examining the 2013 Acura TL next to the 2013 BMW 3 Series, Infiniti G37, Hyundai Genesis, Lincoln MKZ and the Lexus ES 350, and you can spot that the TL outperforms those autos in many zones. Look through the hightlights below. No conglomerate car repair sites in Phoenix, AZ offer Acura of Peoria's amazing combination of certified Acura TL service techs, long warranties on all services and Acura OEM parts. With assistance from Acura of Peoria's car repair masters your Acura will run well. Whether you need us to manage a manageable situation as an oil change, or take on challenging Acura service and repairs like transmission rebuilds, strut and shock repairs, timing belt replacements. Furthermore, Acura of Peoria's always got fair prices on Acura repairs in Phoenix, even for incomplex OEM recommended maintenances. Click the succeeding link to be lead to to Acura of Peoria's service coupons. * Prices shown do not include taxes, license or an $895 destination and handling charge. Actual vehicle/accessory costs, labor and installation vary. Dealers set their own prices. Please consult your selected dealer. Vehicle shown may differ from actual vehicle to be sold. ** Based on 2013 - 2014 EPA mileage estimates, as applicable. Use for comparison purposes only. Your actual mileage will vary, depending on how you drive and maintain your vehicle.